Here’s a great idea for a unique summer act of service: Volunteer at your local animal shelter! In some cases, kids may have to be a minimum age, but at our local shelter, they’ll let any age child volunteer as long as a parent works alongside them. If you’ve got an animal lover, this almost doesn’t seem like a service project, but it is such a blessing for the overworked staff at the shelter. And the animals love the attention! Submitted by Kris Bales, the classically eclectic, slightly Charlotte Mason homeschooling mom to three amazing kids, the Christ-following, sweet tea addicted wife to one unbelievably supportive husband, and the formerly obese, couch-potato-turned-healthy runner of a bunch of 5K races and two half-marathons. 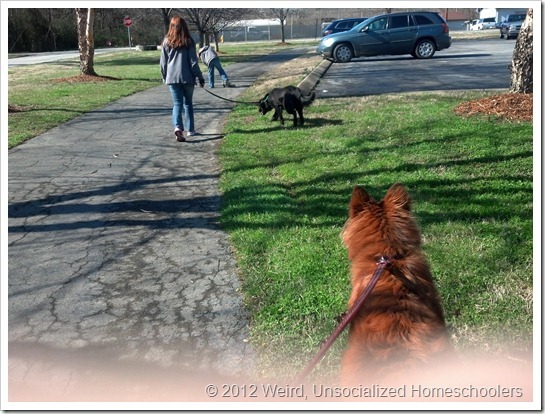 Connect with Kris at her blog, Weird Unsocialized Homeschoolers. That sounds like a lot of fun and something that my daughter and I would love to do. We might do this when our school year starts as her community service project for the year. My daughter has been begging to volunteer at our local dog shelter for the past year. I’ve held off because I know I’ll want to add more adopted fur-babies- but my resistance is wearing thin. Shelters large and small always have a great selection of animals looking for new homes.